No words... Rose gold metallic foil in this rustic wreath design. It's gob smacking. The colours are just divine and melt together perfectly, they just came in and these wedding invitations are just so, so pretty. We are in love with them. The rose gold foil is incredible. The metallic is so luxe the impact is as good as it gets. The colour is just perfect for a wedding, its a soft blush, when the rose gold is combined with all the mints, sage and pinks and peaches in this design, the melting pot is exquisite. The rose gold foiling technique is the best of the best - they make a new plate each time, so you will see your names literally sparkle across the layout - and the plate leaves a beautiful impression into the super thick, fluffy card it's printed on. The 3D nature just one more element adding to this beauty. The foiling is very hard to capture with photographs, so we really recommend ordering a sample if you are not sure - as you will be once you see it first hand! Shiny things are better! Especially in real life. 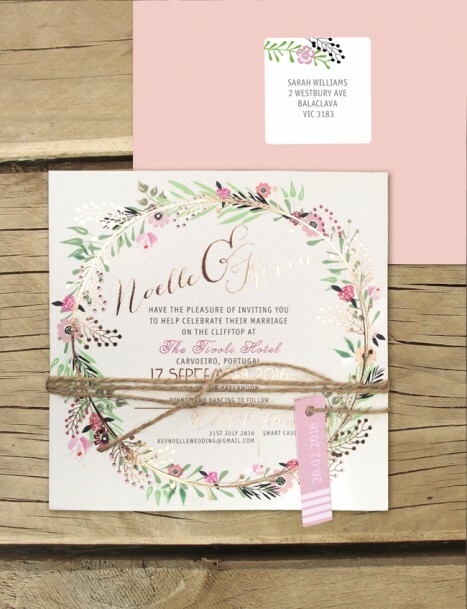 We have paired up this glamour wedding invite with a blush pearla envelope - the perfect match, but we have more other colours and textures in stock, we will put them in your parcel if you order a sample. The rose gold is so on trend at the moment, the soft hues with this design suit so many styles of weddings as well. THIS is one wedding invitation that will be kept forever, that we guarantee! This design comes with all matching wedding stationery items. We will get them up asap. The foiling is one of our more expensive techniques because of its premium nature, the foil and plates that are made each time and the thick card we have chosen to print them on. Nothing has been skimped on here - they are the best of the best, and your guests will know it. But we want to save you costs on other items so limit the foiling to the invite - but matching the rsvp cards, placecards and wishing wells etc but without the foil - they sit really beautifully as a set while saving you money, please email us for pics! We can of course change any of the colours on this design to anything you'd like for no extra fee - but we are just in love with the blush and peony hues with the rose gold! We hope you love this design as much as we do! We are in the process of updating our site but unfortunately getting your guests names printed isn't an option on our foiled designs. We recommend leaving a space to hand write them or writing 'you' in the print instead, unfortunately it's the result of the plate getting made each time. But if you want the names we can look at doing a little swing tag with guests names on there - get in touch for more details.